OK, on the left is my work inbox. I finally replied to everything that needed a reply, so everything there came in today, less than 3 hours ago. Except: whoah, there are 2 messages from the future! Oh, right, timezones. That’s not nearly as fun. I’m also down to the last 5 messages in my personal inbox.. I’ve said I’m going to reply to all of them before, but now I mean it. I now get 2 automatic emails a week reminding me to… answer email. Yes. Progress. Maybe I’m from the future! I’m finally scanning the huge number of slides (and maybe even the smaller number of filmstrips) I’ve shot since buying an SLR in 1998. This has, perhaps, been my longest-term project ever. rgb lent me a Nikon LS-2000 slide scanner in early 2003. Every time I’ve pulled it out to use it, something different has gone wrong (usually with the hardware – it’s old and balky.) A few weeks ago I finally said to myself that enough is enough and it’s time to get everything scanned. I tried to fix the scanner and concluded that the stepper motor driver is fried. Not wanting to do board level repair without a schematic, I simply bought a new LS-2000 on eBay (they’re obsolete now and go for about $200.) 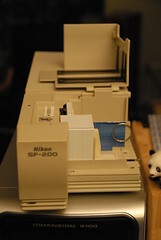 So I now have a new-to-me LS-2000 that works fine, rgb’s SF-200 slide feeder (also balky but easily repaired using an old calling card), and a “parts” LS-2000 I can scavenge from if this one breaks.